Do you have a food blog you’d like to take to the next level? Maybe you started your blog as a hobby and now you’re seriously considering going pro! If so, you won’t want to miss today’s podcast interview with Tessa Arias sharing tips on how to Be the CEO of Your Food Blog. Tessa should know – she’s the popular blogger behind the fabulous site, Handle the Heat! I’m so excited to share with you my conversation with Tessa Arias. Not only is Tessa the creative force behind the popular food blog Handle the Heat, but she’s also recently launched Food Blog Academy, a membership site dedicated to helping food bloggers be more successful. What really caught my attention about Tessa is her commitment to her readers. She surveys her readers consistently to find out what content they’re looking for and she’s committed to delivering only the best quality content, suited to her readers’ needs. How Tessa thought she didn’t have a passion for things like her friends, until she noticed how much she liked watching the Food Network. Eventually she started baking and spending time in the kitchen and the next thing you know, she enrolled in culinary school! How Tessa has taken her love for teaching and poured that into her popular and successful food blog, with some posts that have gone viral! Why you might want to have some bright red lipstick before our next negotiation with brands. How to think like a CEO when working with your food blog. Why it’s helpful to have an editorial calendar. Finally, we talk about inspiration and what inspires Tessa each day. Learn more about today’s guest, Tessa Arias on her site, Handle the Heat. Check out the book Tessa’s Food Blog Academy to learn how to take your food blog to the next level! Why not give Tessa a shout-out on Twitter or Instagram and say thanks for the Chopped Podcast interview! 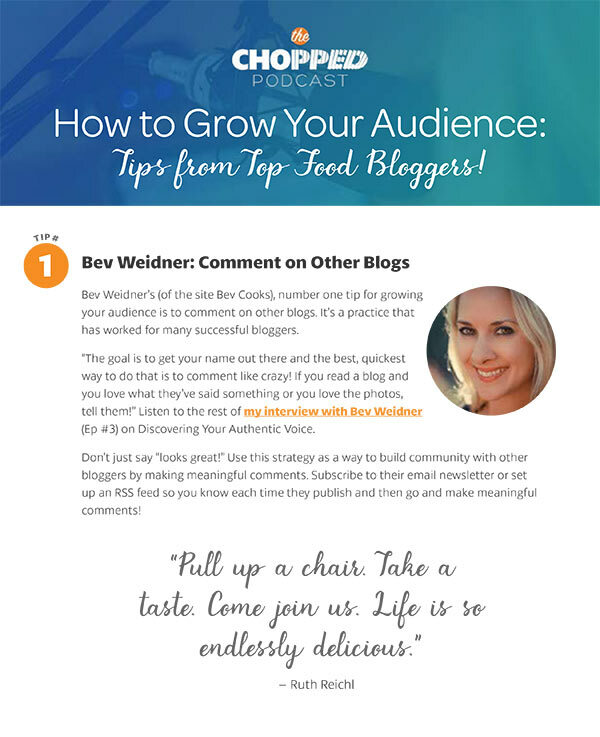 Want to hear more from Tessa about how you can be the CEO of your food blog? Leave a comment below to let h er know. Today’s podcast was sponsored by Best Food Facts. Got a question about the best way to cook your veggies? Want to hear the latest on controversial food topics? Head over to bestfoodfacts.org to learn more about all things food straight from university experts! The next episode of Chopped Podcast will feature an interview with Lindsay and Bjork Ostrom of the blog, Pinch of Yum. I can’t wait to share with you more about their 1%∞ theory. Intrigued? Subscribe to the podcast to be sure you don’t miss it!